Having been on a few inflatable SUPs of late, jumping aboard Red Paddle Co’s 12.6ft Explorer is a unique experience. There’s definitely a specific feel with the brand’s gear. A Red iSUP tends to feel a lot flatter decked than many and sits much lower in the water. Even though the Explorer is perfectly stable, the lower ride only adds to its calm and composed nature. It fits comfortably under your arm with the centrally located webbing strap providing enough to grab on to. Once at the water’s edge, it’s simply a case of launch and go. As you would expect from a board called the Explorer it eats up miles with ease, cutting an efficient line through the brine. While not as piercing as some harder models, it’s no less a worthy cruiser and would be fine in open water, with minimal chop and swell, or on inland lakes and rivers chewing up distance. The flat deck and super hard feel ensure there’s minimum play. Of course, there’s a little ‘bend’ – this is an inflatable after all – but it’s on the minimal side (as long as you inflate correctly). In fact I’d say the Explorer has much less give than many other iSUPs. 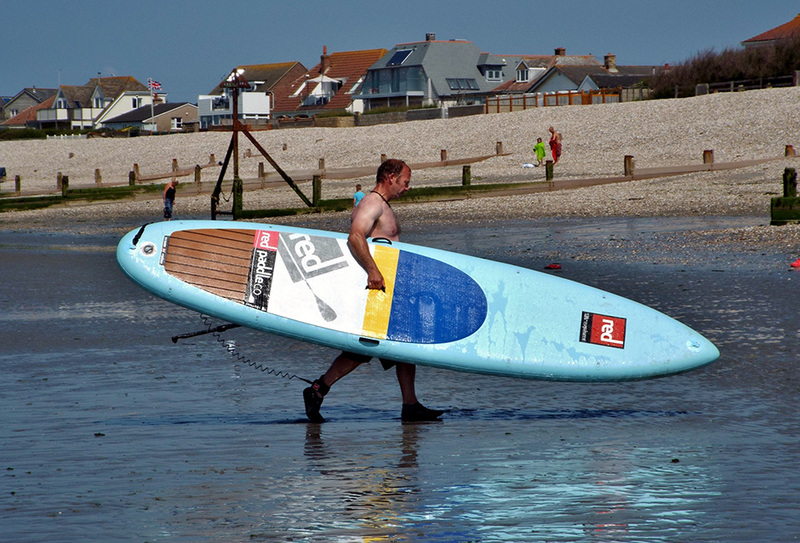 Red Paddle go to great lengths to improve the board’s authentic ‘hard’ feel and any paddler jumping on board will benefit as a result. Tracking through the water was extremely efficient, with much of this down to the guide foil the brand have stuck on the nose. This is great for newbies still having issues keeping in a straight line or better paddlers happy to cruise with the minimum of changes. Fins provided were fine while the deck pad gave good grip and inspired confidence. Putting the hammer down saw the 12.6ft Explorer get up to a decent speed. You’re never going to win races on this board but then that’s not really the point. Cruising and covering ground in good time is where the Explorer’s forte lies and as the brand themselves say: ‘seeing what’s around the next bend’ is the fun of paddling it. Red have put a lot of thought into their bag with everything folding neatly up and securing in a comfortable package. If you’re the type of SUPer who loves going the distance, checking out new locations and chewing up the miles, but struggle with logistics of getting back to point A, this is the board (and bag) for you. Red Paddle Co are right on the money with their inflatable stand up technology and their products speak for themselves. Red aim squarely at the type of paddling that most SUPers do – regardless of skill level. What you get is a quality design manufactured to put a smile on your face and deliver performance for all paddling scenarios. A great distance iSUP for either coastal or inland cruising/exploratory missions.